Tobacco and alcohol use pose significant global public health challenges and are major determinants of preventable morbidity and mortality. Preventing tobacco and alcohol misuse in adolescence before habits are formed is an important policy goal. Previous research into the relationship between tobacco outlet density and smoking prevalence has resulted in mixed findings. Whilst some have reported increased smoking prevalence with a higher density of retail outlets around the home and school others have reported no significant associations. For alcohol a positive association between drinking and alcohol outlet density has been reported around the home for adults, adolescents and around Universities for college students. 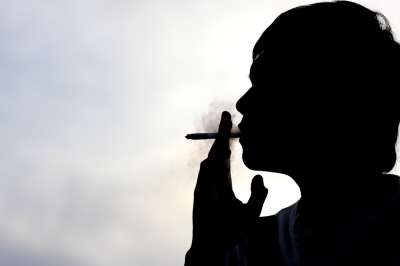 Despite this there have been several calls for a policy response to address the tobacco retail environment, primarily by ‘restricting the number of retailers around child spaces’. We received seed funding from the Scottish Collaboration for Public Health Research and Policy (SCPHRP) to examine the density of tobacco and alcohol retail outlets in Scotland and their association with the prevalence of drinking and smoking behaviours in school aged children. 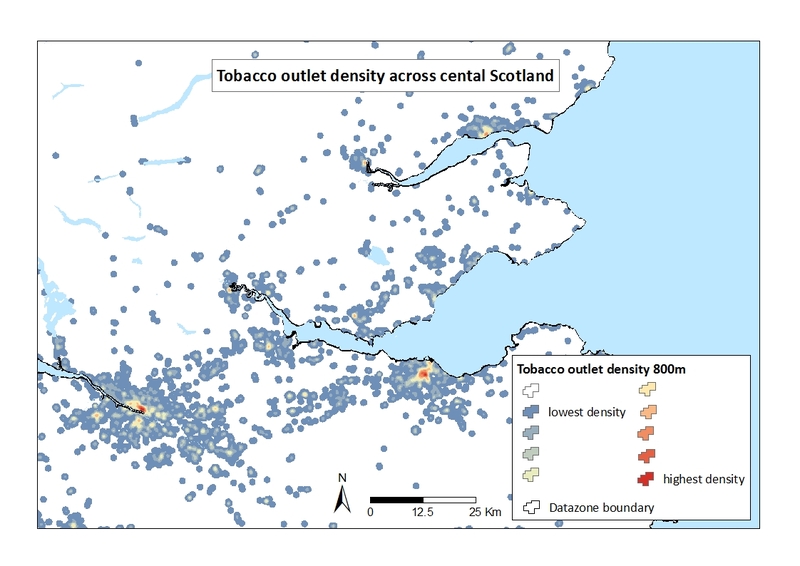 The challenge was to gather data on the locations of all outlets in Scotland selling either tobacco or alcohol and to find suitable adolescent health related behaviour data. We obtained the addresses and postcodes of licensed alcohol outlets by type (on-premise and off-premise sales) from individual Liquor Licensing Boards. Our final dataset consisted of 16,159 outlets of which 4,800 were off-sales and 11,359 were on-sales. The task of collecting, cleaning, sorting and organising these data was no mean feat! The tobacco data was a little easier to gather as the Tobacco and Primary Medical Services (Scotland) Act 2010 established a national register requiring all retailers selling tobacco products to be registered by October 1st 2011. We obtained the addresses and postcodes of all premises registered on the Scottish Tobacco Retailers Register as at 30 September 2012. After removing duplicates and cleaning the data we had 10,161 tobacco outlets. We then used Geographic Information Systems (GIS) techniques, based on Kernel Density Estimation (KDE), to create measures of retail outlet density for every postcode in Scotland: see example maps below for Central Scotland and Glasgow. 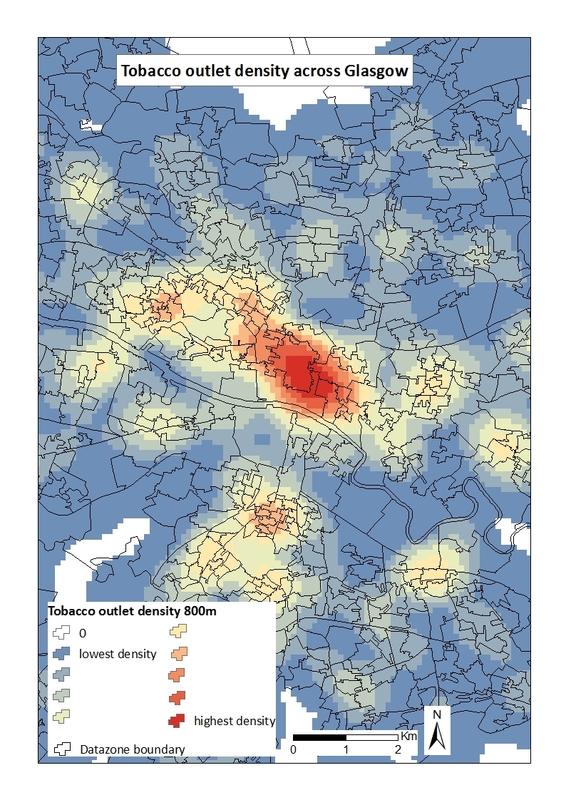 Creating these fine-grained area-based density measures allowed us to explore the association between alcohol and tobacco outlet density and deprivation across the whole of Scotland. Similar work has been done elsewhere but this is the first time this has been done for the whole of Scotland. Our main goal in this project was to gain a greater understanding of the distribution of these outlets and in turn to understand whether a concentration of outlets around either the adolescent’s school or home creates an environment that promotes smoking and alcohol consumption in adolescence. To do this we joined our density measures to individual responses from the 2010 wave of the Scottish Schools Adolescent Lifestyle and Substance Use Survey (SALSUS) (n = 37,307). In this dataset we have an outlet density measure for tobacco and alcohol for each pupil’s home address and school address separately alongside individual level data on smoking and alcohol behaviours. We identified two plausible pathways through which the density of alcohol and tobacco outlets may influence drinking and smoking behaviours amongst youths; the availability pathway and the normalisation pathway. The analysis conducted as part of this research project has focussed on the availability pathway, that increased availability of outlets make it easier for adolescents to engage in related behaviours. This summer we plan further analysis of the normalisation pathway, that increased availability of outlets will normalise alcohol and tobacco implying that use is acceptable thus increasing adolescent smoking/drinking rates.